GPU [ГПУ, Годударственное политическое управление; Gosudarstvennoe politicheskoe upravlenie; in Ukrainian: ДПУ; DPU or Державне політичне управління; Derzhavne politychne upravlinnia [State Political Administration]). Organ of Soviet security police created on 6 February 1922 in place of the Cheka. Unlike its predecessor, the GPU was a regular agency operating within a legal framework under the control of the People's Commissariat of Internal Affairs. Its functions were espionage, suppression of counter-revolutionary activity, and protection of the borders and railways. In Ukraine a republican GPU directed by V. Balytsky was set up by the 22 March 1922 resolution of the All-Ukrainian Central Executive Committee. With the founding of the Union of Soviet Socialist Republics, all the republican GPUs were brought under a new central agency, the OGPU (Обединенное годударственное политическое управление; Obedinennoe gosudarstvennoe politicheskoe upravlenie [Unified State Political Administration]), in November 1923. The status of the agency was raised to that of a separate commissariat directly under the USSR Council of People's Commissars. For the first time the secret police was recognized as a permanent and legitimate feature of the Soviet system and was fixed in the constitution. In spite of its legal position the OGPU continued to be used as an instrument of Party policy. Feliks Dzerzhinsky stayed on as its director and in 1926 was succeeded by his deputy, V. Menzhinsky (1926–34). In the republics the OGPU had its subsidiary organs and a representative on the republican councils of people's commissars. In 1924 the GPU in Ukraine became a people's commissariat of the Ukrainian SSR (see People's commissariats of the Ukrainian SSR). It was headed by V. Balytsky, who sat on the republic's Council of People's Commissars. Branches were organized at the gubernia, okruha, and oblast levels. At first the GPU and OGPU were denied the punitive powers of the Cheka, and retained only investigative and examining powers. By the end of the 1920s, however, the OGPU reclaimed all the extraordinary powers of its predecessor. Sentences were passed without trial and in camera, as in the Cheka period, by the so-called Separate Council of the GPU in Ukraine, or by the Judicial Collegium of the OGPU in Moscow. Like the Cheka the OGPU used ruthless terror against members or suspected sympathizers of any opposition within or outside the Communist Party. It fabricated conspiracies, staged show trials, carried out mass arrests, ran the system of corrective labor camps, and provided forced labor for large-scale projects. In Ukraine the GPU mopped up what remained of the insurgent movement (1922–3) (see Partisan movement in Ukraine, 1918–22), organized the trial of the Union for the Liberation of Ukraine (1929–30), directed mass repressions during collectivization (1929–33), exterminated activists of the Ukrainian Autocephalous Orthodox church and Ukrainian cultural leaders, and suppressed various Party deviations. 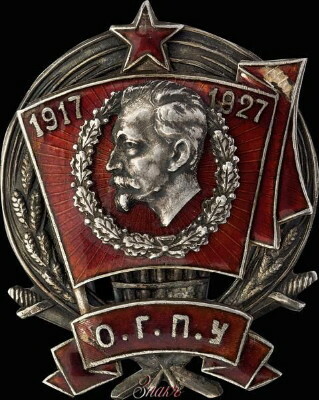 In 1934, after G. Yagoda became head of the agency, the OGPU was reorganized into the NKVD.